It has been my observation that 99% of people who say America is the greatest country in the world,EVER! have never lived anywhere else. Before you call me a hater and stab me with your flag pin, I want to make one thing clear: America is a great country and exceptional at many things. But I have spent enough time living in 3 other countries to appreciate other ways of doing things. There is one thing I am convinced America is exceptional at (and not in a good way)…poisoning ourselves. We are fat, fat, fat. And pretty soon the sheer weight of this country is going to tilt the earth off of its axis and wreak some serious climate havoc. When did Krispy Kreme become acceptable apres-game snack at soccer? Last week, my child was offered a 6 pack of Oreos and a Gatorade after a game. That’s 47 grams of sugar–30% more than the recommended daily allowance for a full grown male. After a soccer game. Need I point out the irony? I bought a dress the other day, size 0. I was a size 2 in high school, and I can tell you with all certainty that things have definitely shifted and settled in the intervening 22 years. In another 20, will I be a -2? If you have any doubt, spend a day at a any given water park in the US. You will conclude that Americans are good at 2 things–feeding themselves and finding new and inventive places to pierce and decorate. I am far from a paragon of healthy living, I did grow up in the South. But I do try to eat things without labels and bend at the waist, occasionally. American innovation has become new things to fry at state fairs. Pizza Hut has given us the pizza with a hot dog stuffed in the crust. 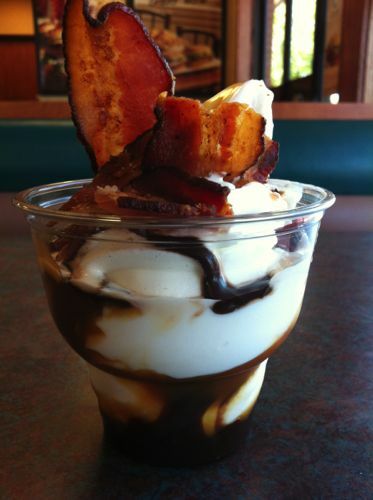 Burger King has unveiled a bacon sundae. Perhaps there is a flaw in our dastardly plan to eliminate other nations via “food” (term used loosely) exports. We won’t be around to enjoy our dominion. Enjoy your fried Kool-Aid ball! This entry was posted in Heresy and tagged bacon sundae, fat Americans, fried kool aid, hot dog stuffed pizza, obesity epidemic, state fair, WTF by blmilhizer. Bookmark the permalink. Reminds me of Kevin’s quote at spring break- ‘mom, we’re at McDonalds, at Disneyworld. I think that puts us at the epicenter of the American obesity epidemic.’ Yup. That’s the thing you missed for a place to really see just how fat Americans are- theme parks! The majority of people on those scooters at Disney aren’t on them because of a broken leg or something of that sort, they are too heavy to comfortably walk around for the day. Really, and that gets them to the front of the line for Buzz Lightyear in front of my healthy weight family, why??? I could go off on the package snacks being dumped upon unsuspecting kids but I’ll leave it alone. Sigh. Yes, but that presumes I do theme parks, which I don’t. That blog writes itself.